1. Place the eggs in a small pan and cover with water. Bring to the boil and cook for 5 minutes, drain and cool under cold water. 2. Separate the lettuce leaves and wash then place on a serving platter. 3. Mix the mayonnaise, mustard, Worcestershire sauce, milk and seasoning. 4. 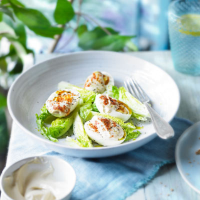 Peel and halve the eggs and lay on top of the lettuce, spoon over the mayonnaise and sprinkle with cayenne.